A very good benchtop planer is worth its weight in gold for a proficient woodworker. That's the reason we've committed our time and efforts to exploring the top benchtop planers you can find on the current market, and presenting you with our findings through this article. When you buy timber, the pieces are typically provided to you in different thicknesses and dimensions. The true use of a benchtop planer is for adjusting the depth or size of timber, and to create a surface that is smooth and “plane” from piece to piece. To put it differently, it's used for cutting boards to size and developing a smoothness and depth throughout the board, and across multiple boards, for larger woodworking projects. If you are a serious woodworker, you should be considering purchasing a benchtop planer as a potential dividend-paying investment in savings on timber. By using a benchtop planer to properly re-surface cheaper, rough-sawn lumber inventory, you can be freed from purchasing expensive timber that has been pre-surfaced and planed. While these machines are more than capable of getting the work done, they shouldn’t be confused with heavier duty wood planers that have strong three-horse motors, capable of ripping through hardwoods with ease, and manage far deeper rips without the threat of slowing down. That said, benchtop planers work wonderfully for most smaller, home-centered woodworking projects and individual home uses without needing a production-quality product. To ensure you are getting the proper planer, though, we put three of the most common benchtop planer models through some rigorous testing, sorting the smoother options from the rougher bodies. All of the planers that are being researched and analyzed relieve users of the incredible burden that comes with power-sanding, and needing to do heavy scratching to properly get rid of snipe or scallop marks. “Snipe” is the term for scoop-type gouges that can be found at the edges of a wood board. They are made when the planer uses a single roller to grip. To properly assess the quality of the cuts, our testers have put both red oak and poplar wood through each planer that we were analyzing. We removed a sixteenth of an inch with every pass. After this, chalk was rubbed onto the recently planed faces of the wood, allowing scalloping marks and potential snipes to show through, caused by cutting head knives and blades. Utilizing sharper blades, a few of the machines that were being tested only needed a little bit of sanding to remove some barely noticeable scalloping. These machines turned out near-perfect boards. Other models not making our list of three required sanding with very coarse sandpaper to accurately remove any scalloping, followed by fine grit sandpaper to get rid of scratches made with the coarse sandpaper. This was simply done to mimic the surface of the non-sanded three outlined below. Regarding snipe, our testing and analysis was unable to get any planers to create snipe-free finishes as they ripped out of the factory. This was even though the quantity of the snipe ranged from very minimal to incredibly noticeable. Sniping was reduced greatly on most all benchtop planers with some rudimentary fine-tuning by additions of outfeed or infeed tables. Both of the planers that sniped the leads had cutter head assemblies that locked onto posts automatically with engagement of a board to the rollers. This prevented the planer from moving in any directions besides where it was being pushed throughout the course of the cut. No obvious benefit was discovered from hand-locked cutter heads. Machines equipped with this sniped at the same level whether auto-locking or manual. Most straightened knife cutting head model benchtop planers feature some kind of self indexing and double edge knife. Knives that fail to self index can prove to be problematic and time intensive to place. Additionally, an automatic cutter head lock can assist as well. This prevents the head from spinning problematically as bolts or knives are removed. Some mobile planers today come with a segmented cutter head composed of 1⁄2 "-thick sections, each having an HSS insert filler, and all cutter heads have multiple cutting edges. The most obvious advantage is that, in case you break one of the cutters, you just spin the affected folds slightly for a brand new cutting edge. Stops and Gauges. Most planers come with a gauge that indicate how much timber is going to be removed with each planer pass. These indicators assist you in avoiding taking too big a snack, which could lead to tear-out or an even deeper snipe. Power. To our surprise, power wasn't a critical element. All planers revealed enough power to handle even eighth inch deep cuts in foot wide hard maple and walnut. Should I be looking for a benchtop planer, or for something else? Benchtop planers are one of many different kinds of planers that are available on the market for woodworkers to purchase and utilize. There also are more heavy duty planers, generally located in larger workshops and businesses. Additionally, woodworkers can find benchtop planers, the subject of this guide, and hand planers. Benchtop planers do not have the same types of abilities that heavier duty thickness planers have. However, its powerful presence is quite noticeable. This is due to the fact that most cannot afford the several thousand dollars needed to buy these heavier duty planers. Even under the circumstances that this falls within your price range, you may not have the workspace available. Since these heavier duty planing machines need an extremely large amount of space for their footprint to safely, effectively work. It is for this reason, amongst others, that benchtop planers can be beneficial for most woodworkers. They are modest in size, yet achieve similar work output to heavier duty planers mentioned above. Differences come in the number of passes required for the same finish. While benchtop planers need more passes than heavy duty planers to achieve similar thickness levels, this is not an issue for many workshop owners. It may not even be an issue for you. So, why spend the additional money to purchase a heavier duty thickness-cutting planer, without ample space for the machine. So, as mentioned earlier, we have performed proper research and have interviewed quite a few woodworking experts to end with the three strongest and most efficient benchtop planers you can buy today. 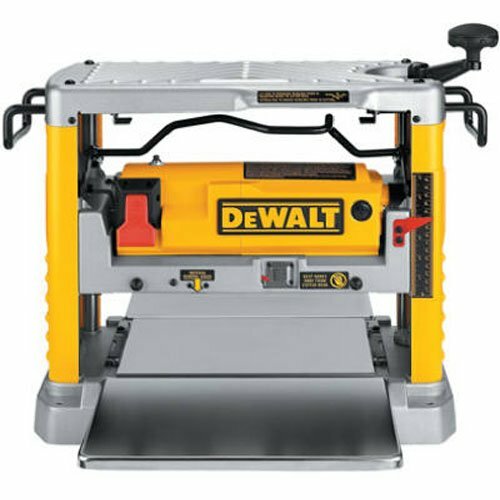 The three strongest benchtop planers that we have found are the DeWalt DW734, the DeWalt DW735 (a step up from the previous), and the Wen 6550. Let’s dig in to each one! This one is the cream of the crop, and is actually produced and manufactured in the small southeast Asian country of Taiwan. In terms of rate and higher revolutions per minute, the DeWalt benchtop planer is a system that can be consistently depended upon. This planer is composed of a 15-amp engine which generates 10,000 rpm’s at its peak intensity. The DW734 comes with a triple-knife cutter head. It's not hard to use, as it provides the user with several fast and precise depth adjustments. Additionally, it includes long feeding tables for accurate support of materials. The knives that accompany the DeWalt benchtop planer are reversible and disposable, which makes it very simple and convenient to use. With this benchtop planer, you can easy create custom and clean stock. One very important characteristic of the DeWalt benchtop planer is that it includes reversible, disposable knives. The knives can easily be reversed and may be disposed of if they're worn out without much trouble. The planer consists of a strong fifteen amp motor boasting twenty thousand RPM, able to easily tackling far bigger cuts in far wider wood. It may handle wider planks compared to the DW734, because its cutting width boasting half an inch larger capacities. It's a triple-knife cutting head that is quite durable with thirty percent longer blade lives. Altering or changing the blade is also quite simple and quick in case of bluntness present with extended use. 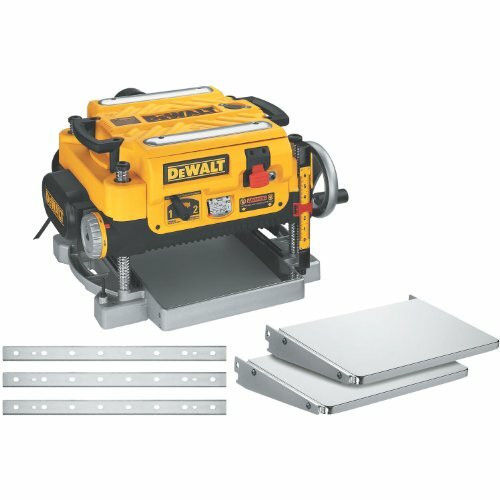 One special characteristic of this DeWalt DW735 benchtop and thickness planer is it's two-speed gearbox with rates of ninety-six cuts per square inch, as well as 179 cuts per square inch respectively, making it possible for consumers to have the ability to modify the feed rate of the planer which optimizes cuts per square inch. More available cuts per inch for woodworkers means that the machine will produce an extremely fine finish on the wood being worked on. However, once you're working in the 179 cuts per inch, then you need to decrease the speed at which the timber is fed in the planer to get the effect desired. The DeWalt DW 735 benchtop planer has a 19-3/4″ aluminum base making it twice as stiff as a standard ten-inch base. It's an abundantly large thickness scale, as well as a folding elimination indicator, ensuring that every cut is quite accurate with each pass of the planer. The larger turret stop of the DeWalt planer enables an operator to easily return to a thickness that's often used at their shop. Additionally, it lets you set a specific thickness you don't wish to go beyond. The Wen 6550 Planer with granite table comes third. It includes a 15-amp engine that's combined with a two blade cutting system. Together it generates a whopping 18,000 cuts per minute in a twenty six foot per minute rate of feeding. A significant addition to this Wen 6550 benchtop planer is the smooth granite table. Additionally, it includes an incredibly sturdy cast iron base that makes it rigid, stable and keeps it from wobbling through operation. 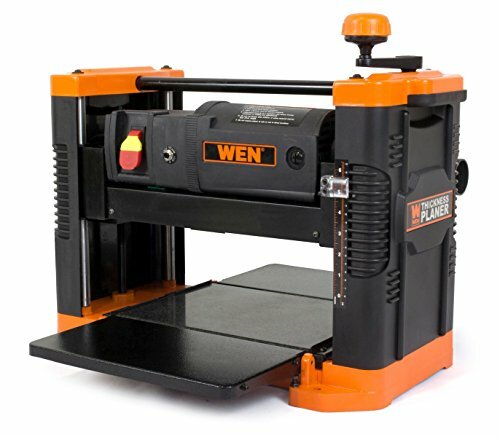 The Wen 6550 benchtop planer has a warranty, and there is an extremely welcoming customer care line in the event you encounter any issues or you have questions to ask. This benchtop thickness planer comes with an all-granite table that makes sure that the surface for setting your board is perfectly horizontal. The granite, unlike other materials, doesn't warp or distort over time. It preserves it integrity for a lengthy time. Besides the fact that the granite table gives a non-marring and smooth surface to the timber to securely and easily glide on. Additionally, it stop the sawdust that emerges through surgery from sticking or clinging to the table's face.